In a play, the fifth act is the final one: the one of the outcome, the conclusion. 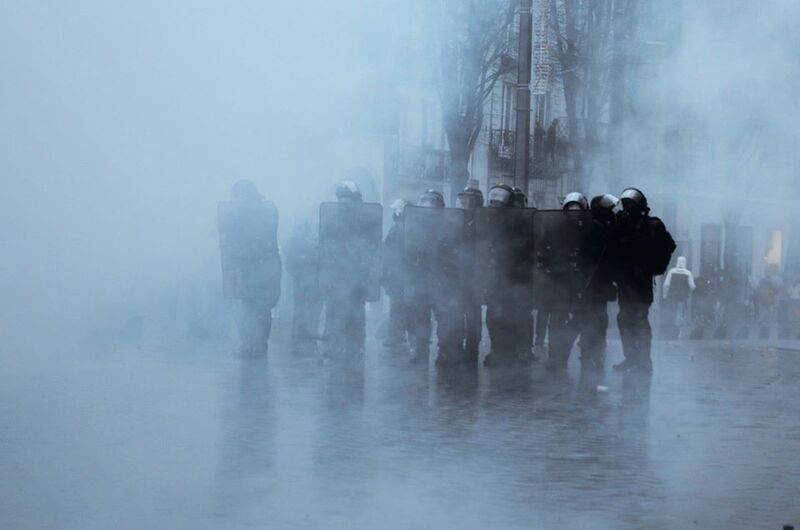 For the fifth act of the Yellow Vests movement, the government seemed ready to do anything to put an end to the dispute. To force destiny. After a week of intense blackmail against a backdrop of anti-terrorism, unrelenting repression of high school students, the government deployed nearly 100,000 police and many armored vehicles, organized the blocking of trains and buses carrying protesters, countless searches, confiscation of protective equipment. And finally the physical crushing of the diehards who persisted in protesting. The scenario of this act was written in advance, even before December 15. The titel of the state scenario was: The movement is running out of steam. in the pouring icy rain. It took courage to show the soaked feet, confronted by hundreds of cops, after being searched several times at police checkpoints. But there were still people. Like last week, the the police blocked the demonsdtration after a few hundred meters in front of the prefecture. The right to protest, radically restricted in recent years, seems to have been abolished for good in Nantes. Some yellow vests, full of good will, came forward to release some yellow and white balloons, “as a sign of peace, in front of a line of shields. This was answered with a deluge of teargas. Charges. Injuries. Between two salvos, big ballotpaper were burned.. It was a symbolic action that took place in front of the prefecture. The entire course of the 50 hostages was saturated with a thick fog, asphyxiating, which does not dissipate in the humid air. This was the start of a strategy of chemical warfare that lasted until the night hours: The entire center and west part of Nantes was drowned by hundreds and hundreds of grenades. There were several attempts to break through the police lines, including the valiant and determined progress of demonstrators in the Bouffay district, which pushed the cops back several hundred meters, or a barricade that people strated to build a few steps away from the Christmas market, or the group that, despite the hyper security operation still wanted to reach city hall and builded a barricade rue de Strasbourg before disappearing. But each time, the repression managed to contain the biggest part of the demonstrations in this giant and suffocating trap, continuously shooting teargas. Shortly before ir got dark A few hundred determined people were pushed back to the Quai de la Fosse, where several barricades were set on fire. Here again, loads of teargas grenades were fired, lovals and people on their cars were panicking. At Chantier Naval, a car belonging to city hall was set on fire. And the demo runned off to the bourgeois districts. Some barricades, luxury cars and a Lacoste shop were attacked. Meanwhile, Yellow Vests disguised as Santa Claus managed to reach the luxury hotel Radisson Blu, their facade was tagged. The cavalry ended up taking over the shopping streets: new gas around the illuminated Christmas trees and the Christmas Market. Vendors come out of their cottages to protest: in return they were massively gassed in their face by brutal cops. But that wasn’t enough to improve the relations between the small bosses and the State. The Market was evacuated. In the dark the police was everywhere. They scoured the whole downtown area. The day seemed to be over but we announced the opening of Maison du Peuple (House of the People, EIE) in Saint-Herblain. Do not hesitate to drop in, there is need of support!